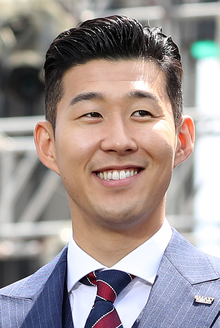 Son Heung-min (Hangul: 손흥민; Hanja: 孫興慜; ; born 8 July 1992) is a South Korean professional footballer who plays as a winger or a forward for Premier League club Tottenham Hotspur and captains the South Korea national team. Son finished his development at Hamburger SV, where he made his debut in the German Bundesliga in 2010. In 2013, he moved to Bayer Leverkusen for a club record €10 million, and played for the club in the UEFA Europa League and UEFA Champions League. Two years later, he signed for Tottenham for £22 million, becoming the most expensive Asian player in history. While at Tottenham, he became the top Asian goalscorer in Premier League history. This is a Korean name; the family name is Son. Son finished his development at Hamburger SV, where he made his debut in the German Bundesliga in 2010. In 2013, he moved to Bayer Leverkusen for a club record €10 million, and played for the club in the UEFA Europa League and UEFA Champions League. Two years later, he signed for Tottenham for £22 million, becoming the most expensive Asian player in history. While at Tottenham, he became the top Asian goalscorer in Premier League history. A full international since 2010, Son has represented South Korea at the 2014 and 2018 FIFA World Cups and is South Korea's joint highest scorer at the World Cup alongside Park Ji-sung and Ahn Jung-hwan with three goals. He has also represented South Korea at the 2018 Asian Games where the team won gold as well as the 2011, 2015, and 2019 editions of the AFC Asian Cup, finishing runners-up in 2015. Son was born in Chuncheon, Gangwon. His father, Son Woong-jung is a retired football player turned manager who once played for the South Korea national football B team. Son came through the academy at FC Seoul, the same club that former Spurs defender Lee Young-pyo played for. However, Son was a ball boy in an FC Seoul home match in 2008 when he was a FC Seoul youth player. At that time, his role model was midfielder Lee Chung-yong, who played for Crystal Palace and Bolton Wanderers. In August 2008, Son dropped out of Dongbuk High School (formerly FC Seoul U-18 Team) and joined Hamburger SV's youth academy at the age of 16 through Korea Football Association Youth Project. One year after, he returned to South Korea. In November 2009, he formally joined Hamburger SV's youth academy. He was impressive in the 2010–11 pre-season, leading the team with nine goals and signed his first professional contract on his 18th birthday. After scoring against Chelsea in August, he was out for two months due to a foot injury. He returned on 30 October 2010 to score his first league goal, against 1. FC Köln in the 24th minute. The goal made Son the youngest Hamburg player to have scored a goal in Bundesliga at 18 years, thus breaking the record held by Manfred Kaltz. Son signed a new deal with Hamburg which would keep him at the club until 2014. It was stated that Son had what it takes to become the next Cha Bum-kun, a legendary Bundesliga forward and fellow South Korean. Son scored three goals in 14 matches in all competition during the 2010–11 season. During the 2011–12 pre-season, Son was explosive, scoring 18 times in only 9 matches. After missing the opening match due to a fever, Son scored two goals within three matches. Unfortunately, mirroring last season, Son picked up an ankle injury in the 4–3 loss to 1. FC Köln on 27 August and was initially projected to be out of action for four to six weeks. His recovery was quicker than expected, however, and he returned to action only three weeks later as a substitute in the 1–0 loss against Borussia Mönchengladbach on 17 September. Over the course of the 2011–12 season, he made 30 appearances for Hamburg and scored five goals, including crucial goals against Hannover 96 and 1. FC Nürnberg at the end of the season to help ensure that Hamburg remained in the Bundesliga. Following Hamburger SV's 2012–13 off-season moves, which saw the transfers of the team's strikers Mladen Petrić and Paolo Guerrero to Fulham and Corinthians respectively, manager Thorsten Fink chose to place Son in a starting role for the team. The 2012–13 season was a breakthrough season for Son as he scored two goals in the away fixture against Borussia Dortmund on 9 February 2013, helping his team to a 4–1 victory. Son was chosen Mann des Tages (Man of the Match) by Kicker. On 14 April, Son netted two goals in a 2–1 win against Mainz 05. He finished the season with 12 goals, becoming the fourth Asian footballer to achieve double-digits in goals in the "Big 3" European football leagues. He finished the 2012–13 season with 12 goals in 34 matches in all competitions. On 13 June 2013, Bayer Leverkusen confirmed Son's transfer for reportedly €10 million, which was the highest transfer fee in club history at the time. He agreed to a five-year deal with the team. Son adjusted quickly to his new club in the pre-season, scoring three goals in his first three appearances for the team in exhibition matches (against 1860 Munich, Udinese and KAS Eupen respectively). On 9 November 2013, Son scored a hat-trick for Leverkusen in a 5–3 win against his former club Hamburgers SV. On 7 December, Son scored a crucial goal against Borussia Dortmund to put his club just four points off the summit of the Bundesliga. On 10 May 2014, Son scored another goal against Werder Bremen ensuring his team a spot for the 2014–15 UEFA Champions League. He finished the 2013–14 season with 12 goals in 43 matches. Son scored a hat-trick against VfL Wolfsburg on 14 February 2015, in a 4–5 defeat, scoring when they were losing 0–3. He finished the 2014–15 season with 17 goals in 42 matches. Son started the 2015–16 season with Bayer Leverkusen. He made a league appearance and a Champions League qualifying match. On 28 August 2015, Son joined Premier League club Tottenham Hotspur for £22 million (€30 million) on a five-year contract, subject to work permit and international clearance. Upon his signing, he became the most expensive Asian player in football history. The record had been held since 2001 by Japanese Hidetoshi Nakata, who transferred from Roma to Parma for €25 million. Son made his debut on 13 September away to Sunderland, being replaced by Andros Townsend in the 62nd minute of a 1–0 win. In Tottenham's first match of the 2015–16 UEFA Europa League on 17 September, Son netted his first two goals for the club in a 3–1 win against Qarabağ FK. Three days later, he scored his first Premier League goal, against Crystal Palace at White Hart Lane, netting in the 68th minute to give Tottenham their first home Premier League win of the season. On 28 December in the match against Watford, Son replaced Tom Carroll in the 80th minute and scored Tottenham's winning goal in the 89th minute. On 2 May, he scored the second goal against Chelsea in a crucial match to give Spurs hope of winning the Premier League. Chelsea equalised in the second half, however, handing over the title to Leicester City. Before the season, he reportedly asked Spurs manager Mauricio Pochettino for permission to leave Tottenham in an attempt to get more playing time, but was instead given a chance to fight for his place at Spurs. On 10 September 2016, Son scored two goals and created a third in his first appearance of the season, in a 4–0 win against Stoke City. Son followed that performance up with a second brace, coming at Middlesbrough on 24 September, earning his team a 1–2 victory. Upon equalling his league goal total from the previous season in 25 fewer matches, Son was hailed by Pochettino as "a different person – he's more mature and he knows the league and he's settled in fantastically now." Son continued his excellent run of form with his fifth goal in five matches on 27 September in the Champions League. Playing at CSKA Moscow, Son slipped a shot past goalkeeper Igor Akinfeev for the only goal of the match. On 14 October, Son was named the Premier League Player of the Month for September, being the first South Korean and first Asian to receive the award. Following the Christmas break Son continued to score the odd goal over the following couple of months and then on 12 March 2017 he scored his first Spurs hat trick in the FA Cup against Millwall in a 6–0 win. He scored in the 2–0 victory away at Burnley on 1 April 2017, and four days later he scored in the 91st minute to put Spurs ahead at Swansea, in a game where they were losing 1–0 after 88 minutes and ended up winning 3–1. A brace at home to Watford the following weekend brought his season total to 18 goals, 11 in the Premier League, his best ever goals return. On 12 May 2017, Tottenham announced that Son had won the Premier League Player of the Month for April, the second time of his career and thus becoming the only player in 2016–17 to win the award 2 times. On 18 May 2017, Son bagged a brace away to Leicester City as part of a 6–1 rout of their former title rivals. With 21 goals in all competitions, Son joined Harry Kane and Dele Alli as the first trio of Spurs players with over 20 goals on the season. Son scored his first goal of the 2017–18 season in the UEFA Champions League game against Borussia Dortmund on 13 September 2017 at Spurs temporary home Wembley Stadium, which Spurs won 3–1. He scored his first Premier League goal of the season when Spurs beat Liverpool 4–1 at home. On 5 November 2017, Son scored the only goal in the 1–0 win against Crystal Palace. The goal brought his tally in the Premier League to 20 and in doing so he became the top Asian goalscorer in Premier League history, breaking the record set by Park Ji-Sung at Manchester United. On 13 January 2018, Son scored a goal and provided an assist in a game against Everton, matching the club record set in 2004 by Jermaine Defoe of scoring in five consecutive home games. On 28 February 2018, Son scored a brace and assisted Fernando Llorente as Tottenham beat Rochdale 6–1 in the 5th Round of the FA Cup. Son also converted a penalty, but his goal was overruled by the video assistant referee. Son has become the first Asian to finish the season as a top-10 goal scorer in the English Premier League. Son was a member of the South Korea national team that participated at the 2009 FIFA U-17 World Cup held in Nigeria. He scored 3 goals in this tournament. On 24 December 2010, Son was named in South Korea national team's squad for the 2011 AFC Asian Cup, making his debut for the national team in a pre-tournament friendly against Syria on 30 December. At the tournament finals, Son scored his first international goal during a 4–1 group stage defeat of India. On 7 October 2011, after initially missing the first two matches of South Korea's 2014 FIFA World Cup qualification campaign on 2 and 6 September 2011 due to an ankle injury, Son played in a friendly against Poland, and was again featured in 11 October World Cup qualifier against the United Arab Emirates. His selection for national team play was a point of concern for Son's father, however, who caused a stir by asking the Korea Football Association not to select his son for the national team in the immediate future so he can rest and mature more as a player. Cho Kwang-rae, then the South Korea head coach, responded by saying that he would continue to call up Son when needed. Son turned down the opportunity to participate in the 2012 London Olympics, opting to concentrate on his club career at Hamburger SV. Son was quoted as saying, "In Korea, an Olympic appearance has a special meaning, but I want to speed up for Hamburg. What matters is to pour all my time into team training." Son did, however, play for the national team in the autumn of 2012 for two 2014 FIFA World Cup qualifiers against Lebanon and Iran, and became a regular call-up in friendlies and World Cup qualifying matches in 2013. In the World Cup qualifier against Qatar on 23 March 2013, Son came on as a substitute in the 81st minute and scored the winning goal in the 96th minute. In June 2014, Son was named in South Korea's squad for the 2014 World Cup. On 22 June, he scored in a 4–2 defeat to Algeria in the team's second group match. The Korea Football Association requested Bayer Leverkusen to allow Son to play in the 2014 Asian Games, as winning the gold medal at the tournament would grant Son exemption from military service. Despite Son affirming his interest and the KFA's efforts, his club at the time, Bayer Leverkusen, refused to release him, as his absence would mean the team would lose him for at least six matches. Son was selected for South Korea for the 2015 AFC Asian Cup in Australia. At the quarter-final stage, he scored both of the team's goals in the 2–0 extra time defeat of Uzbekistan. In the final against the hosts, he equalised in added time, but his team lost 2–1 after extra time. He was chosen as one of three forwards in the Team of the Tournament. On 3 September 2015 at the Hwaseong Stadium, Son scored a hat-trick in an 8–0 home win over Laos in the second round of qualification for the 2018 World Cup. In June 2016, Son was named as an over-age player in South Korea's squad for the 2016 Summer Olympics. Son amassed two goals in the group stages with a goal against Fiji and another against Germany, helping his team to top the group with two wins and a draw. South Korea was eliminated by Honduras in the quarterfinals, with Son missing a handful of chances. On 13 June 2017, Son broke his right forearm after falling awkwardly on his arm during a World Cup qualifier match in Doha against Qatar. He was part of the team that saw Korea qualify for the 2018 World Cup after a 0–0 draw against Uzbekistan on 5 September 2017. On 4 June 2018, Son was selected in 23-man squad for the World Cup. On 23 June, Son scored a goal from outside the penalty area – a curling strike into the top corner – though his side was defeated with a 2–1 loss to Mexico in their second group stage match of the World Cup. On 27 June, during their final group stage match, he scored the second goal in the 97th minute in their 2–0 victory over Germany. Son was selected as one of three overage players permitted in the under-23 team for the football event at the 2018 Asian Games in Indonesia. He captained the team in the final game of the group stage against Kyrgyzstan, scoring the only goal of the match to help the team reach the knockout rounds. He also captained the team in the knockout rounds and reached the final after the Taeguk Warriors beat Vietnam, 3–1. In the final, Son assisted in both extra-time goals in a 2–1 victory over Japan, which guaranteed his exemption from mandatory military service. Son was called up for 2019 AFC Asian Cup in the United Arab Emirates by Paulo Bento, but missed first two group matches due to agreement with Tottenham Hotspur. He returned to London after the side were eliminated by eventual champions Qatar in the quarter-finals. Son is known as a versatile attacker due to his ability to use both feet equally well, and his willingness to play numerous positions on the attacking half. Though he often played second striker with Hamburg, he can also play winger, attacking midfielder or even striker. Son has confirmed this, saying, "I don't care where I play. The main thing is I'm in the game. I can play as a second striker or behind. Whatever the coach says, I'll do. I don't have a favorite position. I'll be anywhere and always on the throttle." Son's explosive pace and positional sense are his greatest strengths. He is known for his ability to find and win space to play, and his close control and clinical finishing make him a deadly forward, especially in counter-attacks. Son is also noted for his productive goalscoring prowess against Borussia Dortmund, having scored 9 goals in 11 matches against the German club in his career. As of match played 16 October 2018. South Korea score listed first, score column indicates score after each Son goal. Son has a sponsorship deal with sportswear and equipment supplier Adidas. 1 2 "Son Heung-Min". 11v11.com. AFS Enterprises. Retrieved 4 January 2018. ↑ "Son Heung-Min: Overview". Premier League. Retrieved 14 March 2018. 1 2 Long, Sam (31 August 2015). "Tottenham's Son Heung-min vows to justify £22m price tag after becoming the most expensive Asian player in history". London Evening Standard. Retrieved 3 September 2015. 1 2 Rice, Simon (5 November 2017). "Son Heung-min sets new Premier League record with winning goal for Tottenham". Metro. ↑ "Ten facts Spurs fans need to know about new signing Son Heung-Min". London24. 28 August 2015. Archived from the original on 31 August 2015. ↑ "6년전 FC서울 볼보이 손흥민의 상암벌 '금의환향'" (in Korean). The Sports Chosun. 30 July 2014. ↑ "FC서울 볼보이였던 손흥민 "청용이형 보며 프로 꿈 키웠죠"" (in Korean). The Sports Kyunghyang. 16 May 2014. ↑ 손흥민 “첫 월드컵 안 두렵다” 이청용 “지성형 몫은 내가” (in Korean). The Sports Kyunghyang. 16 May 2014. ↑ 손흥민 10대1 인터뷰①"하트브레이커 춤? 내가 워낙 몸치라" (in Korean). The Sports Chosun. 22 March 2013. ↑ "KFA 우수선수 해외유학 6기생, 29일 독일로 출국" (in Korean). Korea Football Association. 28 July 2008. ↑ Pröpping, Andreas (6 October 2008). "Abenteuer in einer anderen Welt" (in German). Hamburger Abendblatt. Retrieved 21 January 2011. ↑ "손흥민"독일 함부르크 갑니다"" (in Korean). Kangwon Ilbo. 11 November 2009. ↑ "Son ist Vehs Sturmjuwel". Hamburger Morgenpost (in German). Hamburg. 11 July 2010. Archived from the original on 17 July 2010. Retrieved 21 January 2011. ↑ 손흥민 놓칠라 ... 함부르크 감독 부랴부랴 "계약 늘리자". Yahoo! Korea (in Korean). 6 November 2010. Retrieved 6 November 2010. ↑ "# 123년 함부르크 역사상 '최연소골' 손흥민 "이제 시작"" (in Korean). Sports Seoul. Archived from the original on 4 November 2010. Retrieved 6 November 2010. ↑ Chong, Edwin (6 November 2010). "Son extends Hamburg stay". Sky Sports. Retrieved 9 November 2010. ↑ "Heung-Min Son". Kicker (in German). Retrieved 24 August 2015. ↑ "Korean teenager Son Heung-Min hits four goals in Hamburg's pre-season win". goal.com. Retrieved 7 July 2011. ↑ "Hamburger striker Son scores five in 12–0 rout". The Korea Times. Retrieved 13 July 2011. ↑ "Season-opener ends in 1–3 defeat". hsv.de. Archived from the original on 2 August 2012. Retrieved 6 August 2011. ↑ "Son Heung-Min Statistics". Bundesliga. Retrieved 27 August 2011. ↑ "Bitter! HSV Stürmer Son fällt lange aus" (in German). Quaeng. 29 August 2011. Archived from the original on 6 September 2011. Retrieved 30 August 2011. ↑ "Koo Ja-Cheol, Park Ji-Sung & the top five South Koreans in Europe for the 2011–12 season". Goal.com. Retrieved 25 May 2012. ↑ "Mann des 21. Spieltages Heung-Min Son". Kicker (in German). Retrieved 17 February 2013. ↑ Quinn, Philip (14 June 2013). "Bayer Leverkusen sign Heung Min Son from Hamburg". SB Nation. Retrieved 19 September 2016. ↑ "Werkself fail to press home advantage". Bayer 04 Leverkusen. 23 July 2013. ↑ "Son shines as Leverkusen put five past Hamburg". Archived from the original on 10 November 2013. ↑ "Leverkusen beat Bremen to seal Champions League play-offs". Bundesliga. 10 May 2014. Archived from the original on 4 September 2014. Retrieved 27 August 2014. ↑ "Wolfsburg win thriller at Bayer Leverkusen thanks to Bas Dost's four-goal haul". The Guardian. London. Reuters. 14 February 2015. Retrieved 14 February 2015. ↑ "Heung-min Son " Club matches". World Football. Retrieved 28 August 2015. ↑ "Tottenham sign Heung-Min Son from Bayer Leverkusen". Sky Sports. 28 August 2015. Retrieved 28 August 2015. ↑ "Son Heung-min: Tottenham sign forward from Leverkusen". BBC Sport. 28 August 2015. Retrieved 28 August 2015. ↑ "Koreans hit the big time". Korea JoongAng Daily. 30 August 2015. Retrieved 3 September 2015. ↑ Chowdhury, Saj (13 September 2015). "Sunderland 0–1 Tottenham". BBC Sport. Retrieved 13 September 2015. ↑ Jennings, Patrick (17 September 2015). "Tottenham 3–1 FK Qarabag". BBC Sport. Retrieved 17 September 2015. ↑ "Tottenham 1–0 Crystal Palace". BBC Sport. 20 September 2015. Retrieved 20 September 2015. ↑ Usry, Rob. "Heung-Min Son doubles Tottenham's lead over Chelsea". Retrieved 2 May 2016. ↑ Kilpatrick, Dan (26 September 2016). "Tottenham midfielder Son Heung-Min: I'm very happy to be here now". ESPN FC. Retrieved 28 September 2016. ↑ Jurejko, Jonathan (10 September 2016). "Stoke City 0–4 Tottenham Hotspur". BBC Sport. Retrieved 28 September 2016. ↑ Riach, James (24 September 2016). "Tottenham edge out Middlesbrough as in-form Son Heung-min hits double". The Guardian. London. ↑ "Spurs' Pochettino hails Son Heung-Min after win: 'He is a different person'". ESPN FC. 24 September 2016. ↑ Hytner, David (27 September 2016). "Son Heung-min secures Tottenham Hotspur vital win in Moscow". The Guardian. London. ↑ "Son claims EA SPORTS Player of the Month prize". Premier League. Retrieved 8 April 2017. ↑ Johnston, Neil (12 March 2017). "Tottenham Hotspur 6–0 Millwall". BBC Sport. Retrieved 9 April 2017. ↑ Skelton, Jack (1 April 2017). "Burnley 0–2 Tottenham Hotspur". BBC Sport. Retrieved 9 April 2017. ↑ Pritchard, Dafydd (5 April 2017). "Swansea 1–3 Tottenham Hotspur". BBC Sport. Retrieved 9 April 2017. ↑ Jennings, Patrick (8 April 2017). "Tottenham Hotspur 4–0 Watford". BBC Sport. Retrieved 9 April 2017. ↑ "HEUNG-MIN SON IS APRIL'S EA SPORTS PLAYER OF THE MONTH". Tottenham Hotspur F.C. 12 May 2017. Retrieved 12 May 2017. ↑ Benge, James (18 May 2017). "Heung-min Son, Harry Kane and Dele Alli set new Tottenham goal record". London Evening Standard. ↑ Usry, Rob (13 September 2017). "WATCH: Son Heung-Min takes on all of Borussia Dortmund's defense, scores amazing solo goal". SBNATION. ↑ Dawkes, Phil (13 September 2017). "Tottenham Hotspur 3–1 Borussia Dortmund". BBC Sport. ↑ Wilson, Jonathan (22 October 2017). "Son Heung-min the perfect example of how Mauricio Pochettino uses his different weapons to devastating effect". The Independent. ↑ Crace, John (13 January 2018). "Son Heung-min, Harry Kane lead Tottenham's dismantling of Everton". ESPN. Retrieved 14 January 2018. ↑ MacInnes, Paul (28 February 2018). "Fernando Llorente and VAR grab the attention as Spurs end Rochdale dream". The Guardian. Retrieved 3 March 2018. ↑ Herald, The Korea (14 May 2018). "Son Heung-min becomes 1st Asian to finish season as top-10 scorer in EPL". Retrieved 15 May 2018. ↑ "Tottenham Hotspur: Son Heung-min & Erik Lamela sign new contracts". BBC Sport. 20 July 2018. Retrieved 21 July 2018. ↑ Sutcliffe, Steve (31 October 2018). "West Ham United 1 – 3 Tottenham Hotspur". BBC Sport. ↑ Wallace, Sam; Bull, JJ (24 November 2018). "Chelsea weaknesses exposed as superb Son Heung-min solo goal helps Spurs outclass visitors in London derby win". The Telegraph. Retrieved 25 November 2018. ↑ Hafez, Shamoon (24 November 2018). "Tottenham Hotspur 3 – 1 Chelsea". BBC Sport. Retrieved 25 November 2018. ↑ Drury, Sean (14 December 2018). "Premier League Goal of the Month: Tottenham's Son Heung-Min Wins November Award". Retrieved 14 December 2018. ↑ "Tottenham Hotspur 3-0 Borussia Dortmund: Spurs secure superb Champions League win". 2019-02-13. Retrieved 2019-02-14. ↑ "Heung Min Son of Korea Republic scores". FIFA. 26 October 2009. Retrieved 12 May 2018. ↑ "Son of SV Hamburg tapped to Asian Cup team". The Korea Herald. Seoul. 24 December 2010. Retrieved 23 January 2015. ↑ "S. Korea beats Syria in tune-up for Asian Cup". Yonhap News. 30 December 2010. Retrieved 23 January 2015. ↑ "South Korea march into Asian Cup quarter-finals with 4–1 defeat of India in their final Group C game". Fox Sports. 19 January 2011. Retrieved 23 January 2015. ↑ "Korea to count on domestic stars for World Cup qualifier". The Korea Times. 22 August 2011. Retrieved 27 August 2011. ↑ "Son Heung-min back on national team roster". The Korea Times. 26 September 2011. Retrieved 8 October 2001. ↑ "Korea coach Cho Kwang-Rae to ignore Son Heung-Min's father's claims not to select the Hamburg youngster". Goal.com. 15 October 2011. Retrieved 16 October 2011. ↑ "Son Heung-Min to Miss London Olympics to Focus on Hamburg". Goal.com. Retrieved 24 January 2013. ↑ "Heung-Min Son Bio". ESPN. 20 January 2013. Retrieved 24 January 2013. ↑ "Son Heung-min scorches Qatar with late South Korean winner". The Times of India. Mumbai. Archived from the original on 27 March 2013. Retrieved 26 March 2013. ↑ "South Korea World Cup 2014 squad". The Daily Telegraph. London. 2 June 2014. Retrieved 23 June 2014. ↑ "South Korea 2–4 Algeria". BBC Sport. 22 June 2014. Retrieved 23 June 2014. ↑ "Son Heung-min Won't Be Able to Play at Asian Games". The Chosun Ilbo. Seoul. Retrieved 15 August 2014. ↑ "Asian Cup: South Korea beats Uzbekistan 2–0 in extra-time as Son Heung-min double sends it into semi-finals". Australian Broadcasting Corporation. 22 January 2015. Retrieved 23 January 2015. ↑ Weiner, David (1 February 2015). "Asian Cup final: Socceroos v South Korea at Stadium Australia in Sydney". Fox Sports. Retrieved 28 August 2015. ↑ "AC2015 DREAM TEAM". AFC Asian Cup official twitter. 1 February 2015. Retrieved 8 July 2015. ↑ "Son Heung-Min nets hat trick for South Korea, Shinji Kagawa seals Japan win". ESPN FC. 3 September 2015. Retrieved 3 September 2015. ↑ "Tottenham forward Son Heung-Min skips South Korea's World Cup qualifier to get club career on track". Daily Mail. London. 5 September 2016. Retrieved 25 September 2016. ↑ Kilpatrick, Dan (14 June 2017). "Son Heung-Min breaks arm in South Korea World Cup qualifier – report". ESPN. ↑ Yonhap (6 September 2017). "Tottenham's Son Heung-min silent again as Korea qualify for World Cup". Korean Herald. ↑ "South Korea finalise 23-man squad for the 2018 World Cup, including Heung-Min Son". Talksport. Retrieved 16 June 2018. ↑ "Watch Son Heung-min's beautiful goal against Mexico". SB Nation. Retrieved 26 June 2018. ↑ Brus, Mark. "Video: Tottenham's Son Heung-min scores stunning 2nd goal vs Germany after Manuel Neuer goes walkabout". Caught Offside. Retrieved 27 June 2018. ↑ Duerden, John (31 August 2018). "More than a game: not just gold on line for Son Heung-min in Asian Games final". The Guardian. ↑ Afroni, Donny (21 August 2018). "Son's South Korea captaincy a work in progress". Goal. ↑ Krishnan, Joe (23 August 2018). "Tottenham star Son Heung-Min captains South Korea to 2–0 win over Iran to reach Asian Games quarter-final". London Evening Standard. ↑ "Son Heung-min's hopes of military reprieve rise as South Korea reach final". The Guardian. 29 August 2018. ↑ Ryding, Paul (1 September 2018). "Asian Games: Son-inspired South Korea claim football gold in Indonesia to spare themselves a spell of military service". South China Morning Post. ↑ Zulhilmi Zainal (1 September 2018). "Son helps South Korea U-23 capture Asiad gold, earns national service exemption". Goal.com. ↑ "Spurs confirm Son to join South Korea's Asian Cup squad late". Diario AS. 20 December 2018. Retrieved 30 January 2019. ↑ Cooke, Richard (25 January 2019). "Heung-Min Son set for Tottenham return after Asian Cup exit". Sky Sports. Retrieved 30 January 2019. ↑ Rebien, Florian (30 July 2011). "Wie viele Tore schießen Sie heute, Herr Son?" [How many goals will you score today, Mr. Son?]. Hamburger Morgenpost (in German). Hamburg. Retrieved 16 September 2011. ↑ Bull, J. J. (10 February 2018). "Why Son Heung-min is Tottenham's not-so-secret weapon". The Daily Telegraph. London. Retrieved 10 March 2018. ↑ McNulty, Phil (13 February 2019). "Tottenham Hotspur 3-0 Borussia Dortmund". BBC. Retrieved 14 February 2019. 1 2 3 4 5 6 7 "Son Heung-min: Summary". Soccerway. Perform Group. Retrieved 20 December 2018. ↑ "Games played by Heung-Min Son in 2015/2016". Soccerbase. Centurycomm. Retrieved 8 April 2017. ↑ "Games played by Heung-Min Son in 2016/2017". Soccerbase. Centurycomm. Retrieved 22 July 2017. ↑ "Games played by Heung-Min Son in 2017/2018". Soccerbase. Centurycomm. Retrieved 15 May 2018. ↑ "Games played by Heung-Min Son in 2018/2019". Soccerbase. Centurycomm. Retrieved 1 January 2019. 1 2 "7. 손흥민 Son Heungmin". Korea Football Association. Retrieved 1 January 2019. ↑ "Men's Gold Medal Match: South Korea 2–1 Japan". asiangames2018. Archived from the original on 20 August 2018. Retrieved 1 September 2018. ↑ "손흥민 축구협회 선정 올해의 선수" (in Korean). Yonhap. 24 January 2014. ↑ 손흥민 2년 연속 대한축구협회 올해의 선수 (in Korean). Yonhap. 23 December 2014. ↑ "Son Heung-min wins third Korea Republic Male Player of the Year award". AFC. 20 December 2017. ↑ "2014亚洲金球奖：韩国锋线巨星封王 中国0人" (in Chinese). Tencent Sports. 28 November 2014. ↑ "热刺锋霸获2015年亚洲金球奖 特邀孙继海颁奖" (in Chinese). Tencent Sports. 24 February 2016. ↑ "Son Heung-min wins Best Footballer in Asia 2017". FOX Sports Asia. 5 January 2018. ↑ "Son Heung-min, the Best Footballer in Asia 2018". FOX Sports Asia. 4 January 2019. ↑ "AC2015 DREAM TEAM". AFC Asian Cup. 1 February 2015. ↑ "Top ten goals of the 2014/15 Champions League". UEFA. 14 September 2015. ↑ "2015 Ballon d'Or longlist: Lionel Messi named alongside David Ospina – report". The Guardian. 2 October 2015. ↑ "AFC Asian International Player of the Year 2015: Son Heung-min". AFC. 29 November 2015. ↑ Ooi Kin Fai (29 November 2017). "Son Heung-Min wins 2017 AFC Asian International Player of the Year". Goal.com. ↑ "[KFA 시상식] 손흥민 호주전 동점골, 2015년 올해의 베스트골" (in Korean). Sportalkorea. 23 December 2015. ↑ "손흥민, 축구팬이 뽑은 올해 최고의 공격수·최고의 골 선정" (in Korean). SBS. 19 December 2016. ↑ "축구팬들이 뽑은 '올해의 골'은 손흥민의 독일전 쐐기골" (in Korean). KFA. 13 December 2018. ↑ "Son Heung-Min: Overview". Premier League. Retrieved 29 September 2018. ↑ "FA Cup Top Scorers". BBC Sport. 27 May 2017. Archived from the original on 27 May 2017. ↑ "Son Heung-min voted the PFA Bristol Street Motors Player of the Month". ThePFA.com. 7 February 2018. Archived from the original on 4 April 2018. Retrieved 4 April 2018. ↑ "Hamburg's all-time top XI, featuring Jerome Boateng, Heung-Min Son and Rafael van der Vaart". Bundesliga. 26 February 2018. ↑ "SPURS GOAL OF THE SEASON 2017/2018". Tottenham Hotspur F.C. 9 June 2018. Archived from the original on 12 June 2018. Retrieved 9 June 2018. ↑ Gold, Alasdair (7 June 2018). "Dele and Son star in new adidas World Cup advert with Messi". 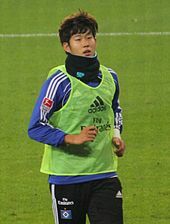 Wikimedia Commons has media related to Son Heung-Min.